St. Petersburg has amassed an eclectic archive of rich milestones and characters across the decades including famous visitors passing through and historical landmarks. But Destination Tampa Bay area sports fans may not realize another treasure lies in their midst, one tucked away behind the trees and the tennis courts of the illustrious Vinoy® Renaissance St. Petersburg Resort & Golf Club and nestled in nearby Northshore Field just north of the hotel, along the waterfront. A long-time tradition remains strong as ever– embarking on its 86th season – and shows no signs of slowing down anytime soon…The St. Petersburg Half Century Softball Club. According to local legend, the St. Petersburg Half Century Softball Club began in 1933 when a group of men gathered at an old ballpark situated where Al Lang Field at Progress Energy Park now sits. There, the group decided if players pitched in their share to purchase bats and balls – 10 or 15 cents each – the group could form their own club. Fast forward to 2018, and the Half Century Softball Club not only continues meeting three times a week for games during the season – the club also plays practice games throughout the summer to stay flexible and boasts nearly 60 active players on its roster. The New York native says when he moved to St. Petersburg, he crossed paths with the Club while walking his dog at the park next to Northshore Field. He noticed that the players were close in proximity to his age, so he began a conversation about nd, the St. Petersburg Half Century Softball Clubwhich led him to join and become a part of its history, too. The St. Petersburg Half Century Softball Club plays a modified (no wind-mill) fast pitch style of softball. Players on the team must be between the ages of 49 to 74 to participate in the softball which is open to both men and women. 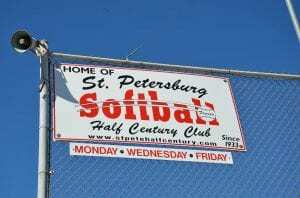 The St. Petersburg Half Century Softball Club regular season runs October through April with games typically held at 9:30 a.m. and 11:30 a.m. on Mondays, Wednesdays and Fridays. Anyone interested in learning more about the Club is encouraged to stop by Northshore Field over the summer during practice games to see it in person and talk with other players. An application as well as general information is available on the Club’s website. The current roster includes about 60 full-time and part-time active members, including one full-time female player. 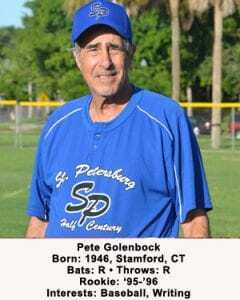 Golenbock had played on softball teams before joining the St. Pete group, having once been a part of a celebrated local CBS newscaster’s celebrity team in NYC. When he began playing here, he was not anticipating the same level of play but found himself pleasantly surprised. This year, the author and professor served as captain of the season-winning Cranes (or Crane-in-Chief, as he quips). He and team members were honored along with the season’s top scoring players at an awards banquet following the playoffs and championship. Millman spoke at the banquet and says the connections that form are a big part of why the Club is so successful. The devoted Yankees fan laughs when describing his amazement and joy when he first learned that a member of the Club happened to be the writer of one of his favorite baseball books he read while growing up, The Bronx Zoo. He knew then this was going to be a special group of people. A quick glance at the roster of last season’s players shows a Club comprised of former educators, pilots, fire chiefs, scientists, counselors and veterans, a diverse mix of people from varied backgrounds but sharing one important bond: a love for the sport. 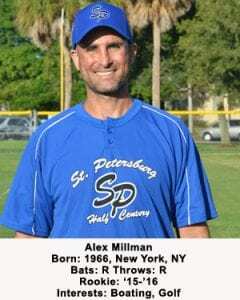 “We’re a club with 85 years of history and 60 brothers and sisters that come together and play ball,” Millman says. For more information about the St. Petersburg Century Softball Club, visit them online at stpetehalfcentury.com or follow them on the club’s Facebook page. For other outdoor sports by Chris Kuhn consider reading this story.